LIV Student Dublin features quality en-suite student residences located close to the city centre and academic institutions. Our student accommodations are also within walking sitance to shopping, dining and many other daily conveniences. Our furnished student apartments are thoughtfully designed, with both en-suite rooms and studio options. Premium hospitality services, Stylish furniture and a comfortable design, Unlimited WiFi, A friendly local team, Full access to the communal area located on the 9th floor overlooking the city, complete with terrace, No hidden costs. Inclusive of all bills available on 41-week tenancy from September, rate shown is per person per week. Situated in an apartment of 6 rooms . Your room has; 2 comfy beds with under bed storage, 2 wardrobes, 2 study desks with chairs, large windows with blackout curtains. A hotel style en-suite with power shower. 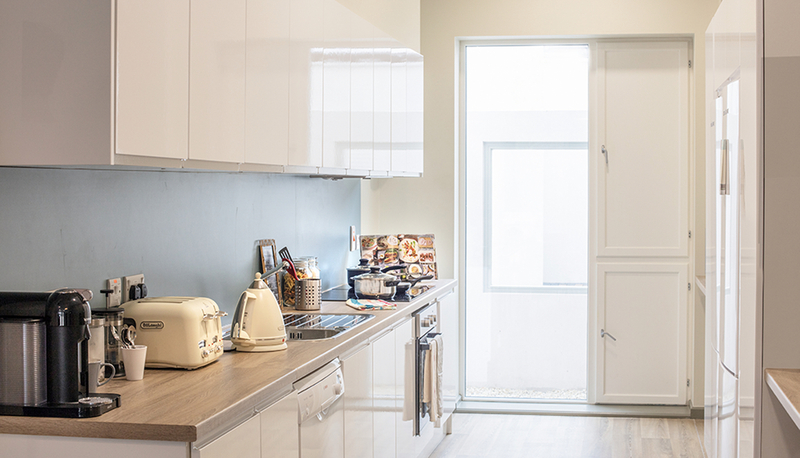 Your open plan apartment living space has mood lighting, galley kitchen with integrated appliances including; dishwasher, extra hobs, fridge freezer, a dining table, soft seating and a stylish TV cabinet with TV. Secure door entry and access to all LIV’s communal space. Inclusive of all bills. Available on 41-week tenancy from September 2019. Situated in an apartment of 8 rooms. Your room has; a comfy mattress, under bed storage, wardrobe, bookcases, cupboards, study desk with chair, large windows with blackout curtains. A hotel style en-suite with power shower. Your open plan apartment living space has mood lighting, galley kitchen with integrated appliances including; dishwasher, extra hobs, fridge freezer, a dining table, soft seating and a stylish TV cabinet with TV. Secure door entry and access to all LIV’s communal space. This room is also available on a 51-week tenancy, please call us for further details. Inclusive of all bills available on 41-week tenancy from September. Situated in an apartment of 5 rooms. Your room has; a comfy mattress, under bed storage, wardrobe, bookcases, cupboards, study desk with chair, large windows with blackout curtains. A hotel style en-suite with power shower. Your open plan apartment living space has mood lighting, galley kitchen with integrated appliances including; dishwasher, extra hobs, fridge freezer, a dining table, soft seating and a stylish TV cabinet with TV. Secure door entry and access to all LIV’s communal space. This room is also available on a 51-week tenancy, please call us for further details. Inclusive of all bills available on 41-week tenancy from September. Situated in an apartment of 6 rooms on the top floor. Your room has; a comfy mattress, under bed storage, wardrobe, bookcases, cupboards, study desk with chair, large windows with blackout curtains. A hotel style en-suite with power shower. Your open plan apartment living space has mood lighting, galley kitchen with integrated appliances including; dishwasher, extra hobs, fridge freezer, a dining table, soft seating and a stylish TV cabinet with TV. Secure door entry and access to all LIV’s communal space. This room is also available on a 51-week tenancy, please call us for further details.